Allstate is being squeezed by rising accident rates and more severe auto related injuries throughout the Chicago area. In Chicago alone, 130 vehicular fatalities were reported and the average number of accidents reported across Illinois each day has risen to almost 800. The Chicago car accident attorneys of Rosenfeld Injury Lawyers LLC have noticed a corresponding increase in the number of cases we’ve taken on as a result and are concerned by current statistical trends. In addition to costing victims more money for expensive medical care, the increased accident rates are forcing insurance companies like Allstate to make adjustments to their business models to remain profitable. Gas prices have plummeted over the last few years, prompting more people to purchase vehicles and to drive more frequently. This is one of the contributing factors to the increase in accidents over this time period, but other factors have equal weight. New technologies provide additional distractions to drivers and when combined with increased traffic volume, create a recipe for more accidents and more severe injuries. Allstate and its partner Esurance have both responded to the increase in accidents with broad rate hikes that are likely to anger customers. 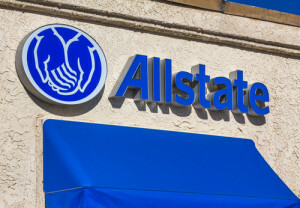 Allstate rates rose approximately 1.5% in 34 states and the insurer reports that they plan to raise rates even further. Meanwhile, Esurance rates have climbed by 4.8% over the last year with no end in sight due to the increased cost of processing and settling a growing number of claims. In 2013, over half of all reported car accidents occurred within Cook County, including 130 fatalities. More than nine people are injured in Illinois each hour due to car accidents and almost five injuries per hour occur in or near the City of Chicago. The National Safety Council estimates that the financial cost of accidents across the state exceeds $5.7 billion each year and this number is continuing to rise. As Allstate processes an increase in claims, it must address its losses by raising rates— meaning that an increase in accidents is having a punitive effect on drivers throughout the city. Insurance companies are not in the business of losing money and will do whatever is necessary to limit their financial liability. It is for this reason you need the advice and representation of a lawyer who has experience working with insurance companies. Rosenfeld Injury Lawyers LLC is a leading Chicago car accident law firm that can assist you in recovering the damages you are entitled to. Our attorneys have collected compensation on behalf of thousands of clients and are happy to review your case free of charge. Once we collect all of the information we need to perform a thorough evaluation of your case, we will review your legal options and answer any questions you have about your rights. We work solely on a contingency basis, so you will never be required to pay for our services unless we succeed in recovering damages on your behalf.